While the whole history of Wolverton has been (as far as we know) relatively peaceful, there have been times when settlements have moved. Archaeologists have discovered a Bronze Age settlement at Wolverton Turn in recent times and there was a discovery of a bronze Age hoard at Stonebridge House Farm earlier in the last century. The settlement at Wolverton Turn appears to have been a farming community of sorts. At the time of the Romano-British period, 55-400 AD, there were farming settlements at Bancroft and in the Manor Farm area. The Bancroft villa was very prosperous but it does not appear to have survived the collapse of the Roman administration, although the archaeologists did discover signs of continued farming activity in the 5th century. Historians, now having the benefit of the work of 20th century archaeologists, are revising the long-held view that the country was overrun by marauding Germanic invaders in the 5th century. What now appears to have happened is that there was at first small settlements of immigrant farmers in the early parts of the 5th century but that this increased to a flood by the end of the century. The pattern was probably closer to that of European settlement in North America. In the 16th and 17th centuries there were small groups of pioneer settlers living alongside the native population on the eastern seaboard. By the 19th century immigration was in full spate and the native populations were overwhelmed. We can probably envisage something like this happening in Wolverton. 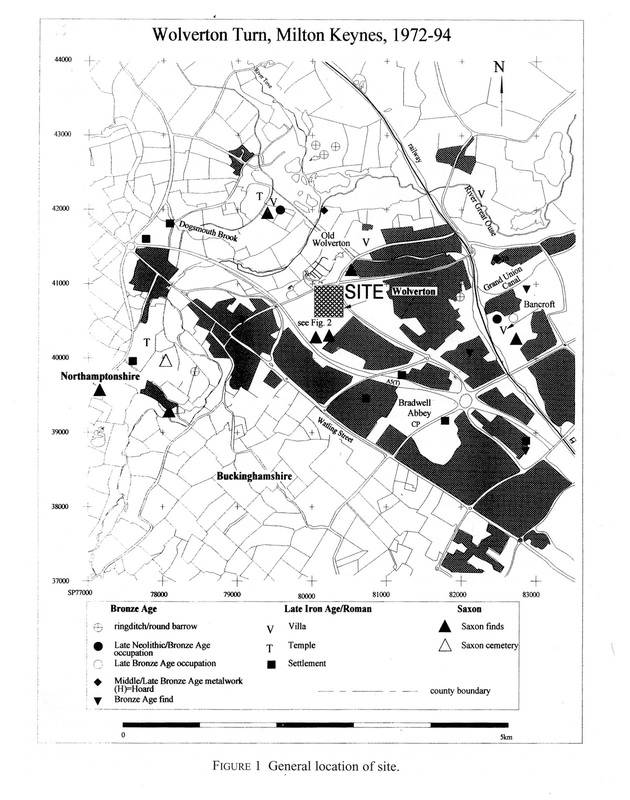 The native British were probably still farming in and around Bancroft and Manor Farm and when the Anglian people came, possibly early in the 6th century, they were able to move onto vacant land, in this case at Wolverton Turn. Archaeological work was undertaken here in the 1970s and in the 1990s. During the second dig the archaeologists unearthed strong evidence of an Anglian settlement in the 6th century. These dates fit into the general framework of the English settlements; they came in small numbers after 420AD to settle on the east coast and in increasing numbers as the century progressed. After 590 the migration became quite large and newcomers moved further inland. We know that the land had been cleared in the Bronze Age and it was always assumed that once farming stopped the land would be reclaimed by woodland, but again modern archaeology has challenged that assumption. Land once cleared largely remains so with some loss to trees at the edges. Grassland can take hold and remain for centuries. In the light of this we can assume that the newcomers found this land, neglected and unused certainly, but with some work could be made productive. Thus we can imagine a situation whereby the English newcomers, who in no way appeared to threaten the livelihood of the natives, were allowed in without any kind of struggle. That peaceable adaptation, not glamourous but plausible, did not prevail in succeeding centuries as powerful individuals and tribes struggled for supremacy. The settlement at Wolverton Turn was Wolverton’s first medieval village. Some time in the 9th century it moved to more arable field in the west. This became the site of Wolverton’s second village until it was depopulated by enclosure in the 16th and 17th centuries.